Picture from simon3 : Left the eastern track. Right the northern track. Picture: Left the eastern track. Right the northern track. Very different approaches to tracks. Let's start with a great example of a mountain path. Descending Slieve Binnian East Top towards Carrick Little requires a fairly steep descent. On 18th Aug 2012 a group of us were on this leg of a longer route which you can see elsewhere on this site as Track 2001. A lot of the slope is rough mountainside which you will encounter if you want to visit any of Ireland's 60 summit areas. In the Mournes the natural hazards include big sometimes unstable granite boulders with occasional wet mushy areas, usually well tracked. By way of introductory contrast, other areas can have different and sometimes worse conditions. Not long ago I was descending an untracked summit which had a hundred metres descending through metre and a half tall rushes on a deeply channelled boggy surface. You couldn't see where your feet were and every step through the rushes provoked clouds of blood thirsty flies. 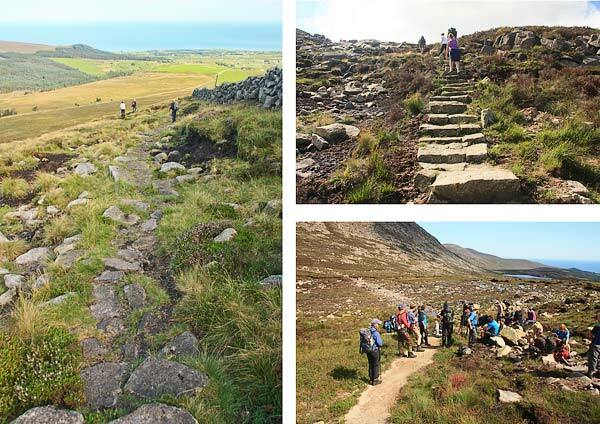 The Mournes is a gentle introduction to Irish hillwalking by comparison. On the left of the picture is a shortish stretch of track on the east slope of Slieve Binnian East Top. An unobtrusive but effective path isn't it? Something like crazy paving, flush with the surface so that vegetation can easily grow through it. Now look at the new works on the path top right. This is on the north side of Slieve Binnian North Top. Much more visible isn't it? It has sharp regular edges standing above the surface. It's hard to see how the vegetation will ever soften the edges of the track. Anything so obviously constructed detracts from the near wilderness experience. It has brought a staircase to a hillside. By way of contrast, it would have to be said that there's far worse than this such as the railway sleepers that blot the landscape of some high usage parts of Wicklow. Nevertheless it is still unnecessarily obtrusive. As of August 2012 the path continues up to the Slieve Binnian North Top and parts of the upper track were less obtrusive and less objectionable; thankfully the constructed does not continue towards Slieve Binnian. This north ridge leading to Slieve Binnian's main top is a unique wonder of Northern Ireland, because of the natural but apparently sculpted tors positioned as if in a work by a surrealist. It would be a huge shame if the straight high contrast lines of a modern planned track interfered visually with this. Bottom right is a picture of a meeting to hear points of view about the works. The meeting raised various other questions such as how necessary are paths anyway and who exactly formed the consensus that these works were based on? Following discussion many of the walkers chose to avoid using the steps on the way up Slieve Binnian.